Native Range: Atlantic, Arctic, Great Lakes, and Mississippi River basins from Nova Scotia and Quebec west to Great Slave Lake, Northwest Territories, and south to Ohio, Illinois, and Nebraska; south in Atlantic drainages to Santee River, South Carolina (Page and Burr 1991). Goode (1884) reported the species east of the Alleghany Mountains as far south as Georgia. Table 1. States with nonindigenous occurrences, the earliest and latest observations in each state, and the tally and names of HUCs with observations†. Names and dates are hyperlinked to their relevant specimen records. The list of references for all nonindigenous occurrences of Perca flavescens are found here. Means of Introduction: Primarily introduced through stocking, either intentional release by fisheries agencies or bait-bucket transers by anglers. Status: Established in most areas where introduced. Extirpated in Arkansas. Impact of Introduction: Yellow Perch compete with trout for food and likely prey on young trout (Coots 1966). Nonnative predators, including Yellow Perch, have been shown to reduce the abundance and diversity of native prey species in several Pacific Northwest rivers (Hughes and Herlihy 2012). Remarks: Although Yerger (1977) and Lee et al. (1980 et seq.) considered this species to be introduced into the Apalachicola River in Florida, it may actually be native. Because the Apalachicola drainage was not adequately sampled in early years, introduced status may be incorrectly assumed for some species. 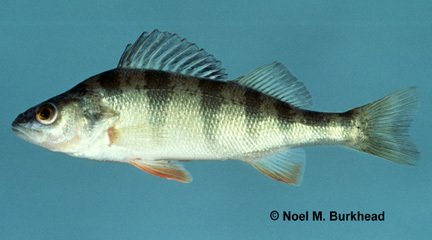 Yellow Perch was first collected in the Mobile basin circa 1850, long before any stocking took place, indicating the species was native to this region. This record was overlooked by Lee et al. (1980 et seq.). Hence, Perca flavescens may be native to eastern Gulf drainages in Alabama, Florida, and Georgia, not introduced. Populations in Atlantic coastal drainages of Georgia, such as the Altamaha and Savannah, have been reported (Dahlberg and Scott 1971b) to be introduced. In fact we believe these populations are more likely native. Dill and Cordone (1997) gave a detailed history of this species and its introduction into California. Anonymous 2004. Idaho warm water fish. http://www.idfishnhunt.com/warmwatermenu2.html. Bailey, R.M. and M.O. Allum. 1962. Fishes of South Dakota. Miscellaneous Publications of the Museum of Zoology, University of Michigan, Ann Arbor, MI 119:1-131. Baxter, G.T., and J.R. Simon. 1970. Wyoming Fishes. Wyoming Game and Fish Department, Cheyenne, WY. Beckman, W.C. Guide to the fishes of Colorado. Colorado Department of Game and Fish, Boulder, CO.
Behnke, R.J., and D.E. Benson. 1980. Endangered and threatened fishes of the upper Colorado River basin. Cooperative Extension Service Bulletin 503A, Colorado State University, Ft. Collins, CO.
Boschung, H.T. 1992. Catalog of freshwater and marine fishes of Alabama. Bulletin of the Alabama Museum of Natural History 14:1-266. Bowers, G.A. 1905. Report of the Commissioner of Fisheries to the Secretary of Commerce and Labor for the fiscal year ending June 30, 1904. Government Printing office, Washington, DC. Bowers, G.A. 1906. The distribution of food fishes during the fiscal year 1906. Report of the Commissioner of Fisheries for the Fiscal Year 1906 and Special Papers, Bureau of Fisheries Document 613, Government Printing office, Washington, DC. Burr, B.M., and M.L. Warren, Jr. 1986. A distributional atlas of Kentucky fishes. Kentucky State Nature Preserves Commission, Frankfort, KY.
Coots, M. 1966. Yellow perch. 426-430 in A. Calhoun, ed. Inland Fisheries Management. California Department of Fish and Game. Cross, F.B. 1967. Handbook of fishes of Kansas. State Biological Survey and University of Kansas Meuseum of Natural History, Topeka, KS. Cushing, B. 2003. Letters - Bucket biology. Montana Outdoors 34(5):2. Goode, G.B. 1884. The Fisheries and Fishery Industries of the United States. Section I: natural history of useful aquatic animals. Government Printing Office, Washington. Halliwell, D.B. 2003. Introduced fish in Maine. MAPB series: Focus on Freshwater Biodiversity. Idaho Fish and Game. 1990. Fisheries management plan 1991-1995. Appendix I - a list of Idaho fishes and their distribution by drainage. Idaho Fish and Game, Boise, ID. Johnson, R.S. 1915. The distribution of fish and fish eggs during the fiscal year 1914. Appendix I to the Report of the U.S. Commissioner of Fisheries for 1914. Bureau of Fisheries Document 808. Little, J. 2000. State to poison perch. Anchorage Daily News, June 8th. Madison, D. 2003. Outlaw introductions. Montana Outdoors 34(4):26-35. Mettee, M.F., P.E. O'Neil, and J.M. Pierson. 1995. Fishes of Alabama and the Mobile basin. Oxmoor House, Inc., Birmingham, AL. Miller, R.J., and H. W. Robison. 1973. The fishes of Oklahoma. Oklahoma State University Press, Stillwater, OK.
Miller, R.R., and C.H. Lowe. 1967. Part 2. Fishes of Arizona. 133-151 in C.H. Lowe, ed. The Vertebrates of Arizona. University of Arizona Press, Tucson, AZ. Minckley, W.L. 1973. Fishes of Arizona. Arizona Fish and Game Department, Sims Printing Company, Inc., Phoenix, AZ. Moyle, P.B. 1976. Inland fishes of California. Unviersity of California Press, Berkeley, CA. O'Malley, H. 1919. The distribution of fish and fish eggs during the fiscal year 1918. Appendix I to the Report of the U.S. Commissioner of Fisheries for 1918. Bureau of Fisheries Document 863. O'Malley, H. 1920. The distribution of fish and fish eggs during the fiscal year 1919. Appendix I to the Report of the U.S. Commissioner of Fisheries for 1918. Bureau of Fisheries Document 878. Oregon Department of Fish and Wildlife. 2000. Warm Water Game Fish Records. Oregon Department of Fish and Wildlife, Portland, OR. Paragamian, V.L., and D.C. Laude. 2010. Kootenai River fisheries investigation: stock status of Burbot. Idaho Department of Fish and Game, Boise, ID. https://collaboration.idfg.idaho.gov/FisheriesTechnicalReports/Res10-10Paragamian2009-2010%20Kootenai%20River%20Fisheries%20Investigation%20Stock%20Status%20of%20Burbot.pdf. Propst, D. L., and C. A. Carlson. 1986. The distribution and status of warmwater fishes in the Platte River drainage, Colorado. Southwestern Naturalist 31(2):149--167. Rasmussen, J.L. 1998. Aquatic nuisance species of the Mississippi River basin. 60th Midwest Fish and Wildlife Conference, Aquatic Nuisance Species Syposium, Cincinnati, OH, Dec. 7, 1998. Ryon, M.G., and J.M. Loar. 1988. A checklist of fishes on the Department of Energy Oak Ridge Reservation. Journal of the Tennessee Academy of Science 63(4):97-102. Shrader, T. 2000. Effects of invasive yellow perch on gamefish and zooplankton populations of Phillips Reservoir. Oregon Department of Fish and Wildlife, Portland, OR. Smith, H.M. 1896. A review of the history and results of the attemps to acclimatize fish and other water animals in the Pacific states. Bulletin of the U.S. Fish Commission for 1895 1896:379-472. Starnes, W.C. and D.A. Etnier. 1986. Drainage evolution and fish biogeography of the Tennessee and Cumberland rivers drainage realm. 325-362 in C.H. Hocutt, and E.O. Wiley, eds. The zoogeography of North American freshwater fishes. John Wiley and Sons, New York, NY. Tilmant, J.T. 1999. Management of nonindigenous aquatic species in the U.S. National Park System. National Park Service. Titcomb, J.W. 1904. Report on the propagation and distribution of food-fishes. Report of the Commissioner for the year ending June 30, 1902. U.S. Commission on Fish and Fisheries 28:22-110. USFWS. 2005. U.S. Fish and Wildlife Service, National Wildlife Refuge System Invasive Species Survey Information. http://www.nwrinvasives.com/index.asp. Waldrip, L. 1993. 1992 fish stocking report. Texas Parks and Wildlife Department. January 8, 1993. 1993: 9-12.